I received a copy of this book from the publishers and this is my honest opinion of the book. Dona, Lady St Columb, being bored with life at court, has escaped London, travelling to her Cornish estate, Navron. Here she enjoys lazy days and solitary evenings. Until she discovers her house has been used by a pirate. After a rather rude introduction to this pirate, known locally as 'The Frenchman' she realises she has found a kindred spirit and found love in the process. 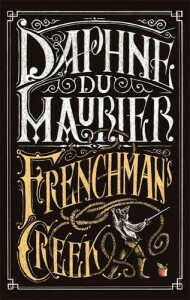 Virago Modern Classics has reissued Du Maurier's Frenchman's Creek, along with Jamaica Inn and Rebecca in beautiful new editions, with YA editions also available for the first time. Having not read any of Du Maurier's work before I jumped at the chance to read one of these new editions. Frenchman's Creek reminded me of a grown up adventure story, a grown up Blyton. There was a fantastical quality to it. Whilst it didn't grab me initially I did want to read it to see what happened to The Frenchman and his crew, hoping that they escaped the hangman's noose. I have to admit I didn't warm to Dona. She came across as spoiled and selfish, putting her children at risk for her own happiness. Granted the story was set in a different era but she had chosen to marry her husband, on a whim almost, and so had to live with her decision. Her actions with The Frenchman, were also taken on a whim, a form of entertainment initially, that led to more. However I did like The Frenchman. Open in his actions, he came across as charming, erudite and determined. The character of William was also a joy to read and I loved the interactions between him and Dona. I even liked Harry, Dona's husband. Yes he was a drunk and enjoyed his role as man of leisure a little too much, but he loved Dona and was genuinely trying to make her happy. Frenchman's Creek is perhaps not what I had expected from Daphne Du Maurier, but this was based on my little knowledge of her work. If you are looking for a tall adventure, with swash-buckling action and a dash of romance then Frenchman's Creek may be for you.